This is a Latin dance and is a mix of different Cuban dances. There are many different regional versions of the Salsa, most of which are North American. In Salsa, weight shifts are done in the hips with arm and shoulder movements incorporated. With the New York style, the dancers remain in front of each other while in the Cuban style they circle around each other. American Smooth along with American rhythm are the two forms of ballroom dancing that make-up the American style. 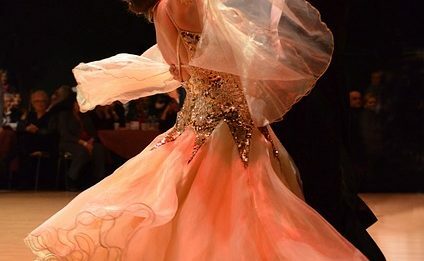 It is made up of four dances; the Waltz, Tango, Foxtrot and Viennese Waltz. The dance is influenced by Fred Astaire and Arthur Murray amongst others. The Foxtrot is a smooth dance and is known for its long, continuous flowing movements across the width and depth of the dance floor. It was developed in the 1910s reached its height in popularity in the 1930s. 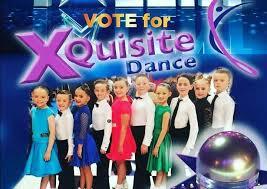 ‘Xquisite Dance’ are a dance school operating in Tallaght, Dublin and in Cork, where children and adults can learn everything from Hip Hop to Ballroom and Latin dancing. Xquisite consider themselves not just a dance school but a family and encourage all who are involved to express themselves in so many ways. Tonight we are delighted to have on the stage a group of young children from Xquisite Dance. 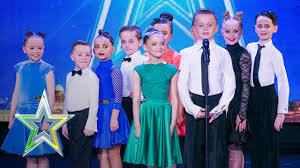 This group become world famous when they came second in the ‘Ireland’s Got Talent’ TV competition in March 2018. They performed incredible routines in ballroom and latin dance and won the hearts of the nation in their journey to the final and runners up spot. We are thrilled to have the children perform for us tonight. 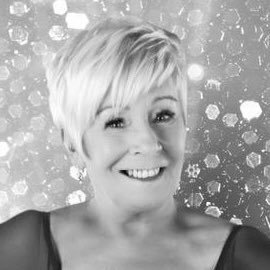 Brendan has hosted our show for the last four years and has become a huge contributor to the success of Ozanam Come Dancing! 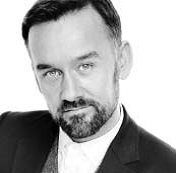 Brendan is a TV Presenter, producer and a fashion designer. Brendan has produced and presented countless TV programmes over the years and has been a regular face on our screens for nearly 20 years. Brendan won great acclaim for his documentary’s including ‘We need to Talk about Dad’ and most recently his RTE series ‘This Crowded House’. In 2012 Brendan co-launched women’s wear collection “Lennon Courtney” which is now exclusively available at Dunnes Stores. We are delighted and honoured to have Brendan back as our host again for tonight’s show. Eilish O’Carroll is an actress, writer, comedian and cast-member of the popular TV sitcom, Mrs. Brown’s Boys, where she plays the title character’s best friend and neighbour, Winnie McGoogan. 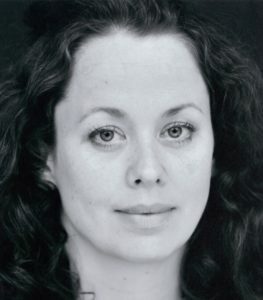 Eilish has played the role of Winnie since the show’s debut in 2011. Eilish is fresh from her exploits as a contestant on RTE’s ‘Dancing with the Stars’ where she learned all of her great dancing knowledge that she is looking forward to sharing with us tonight. 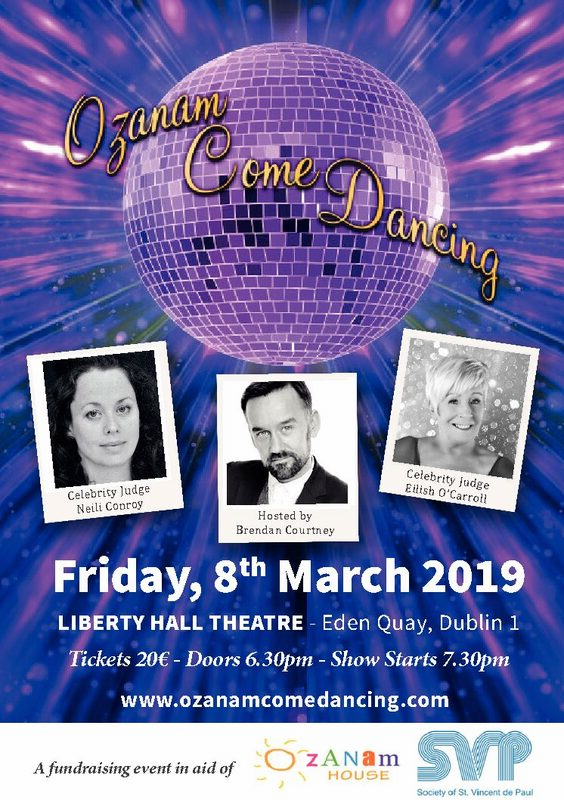 Eilish is delighted to join our judges table and is proud to be supporting Ozanam House SVP. 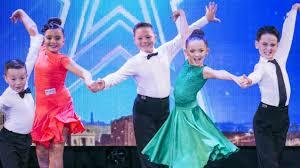 Brian Keogh began his career on the ballroom dance floor at the tender age of 4. 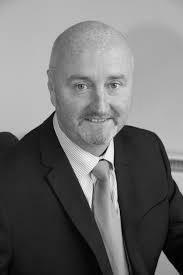 He has represented Ireland for many years in numerous international competitions across the world. Brian is a qualified adjudicator and is no stranger to “Come Dancing”. He has also performed in numerous stage, TV and film productions and has worked on productions at the Gaiety, Olympia and the Helix. Along the way Brian has been nominated and won a number of awards at festivals throughout the country. We are delighted to have Brain back again with us this year to share his expertise with us this evening.